When Is A Dinosaur An Elephant? I pounded the padded carpet this week at the Embedded Systems Conference in San Jose where I witnessed the wonder that is Woz, interviewed new FPGA prototyping start-up BEECube, and pondered why exactly Green Hills employed a dinosaur as their main event this year. I also picked up some righteous swag! If you like the idea of this new series be sure to drop a comment in the box below. 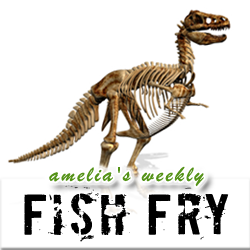 I appreciate all of your comments so far, and we will be working to enhance the Fish Fry each week – as long as you’re watching.